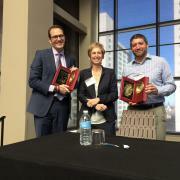 The 111th Annual Conference of the National Tax Association, held November 15-17, 2018 in New Orleans, LA, was co-chaired by two members of the OTPR Family -- Kevin Markle, advised by OTPR Alum, Doug Shackelford, and Mike Lovenheim, OTPR Alum. They organized a great conference that was attended by the largest group ever. Pictured left are Kevin, Rosanne Altshuler, President, and Mike. 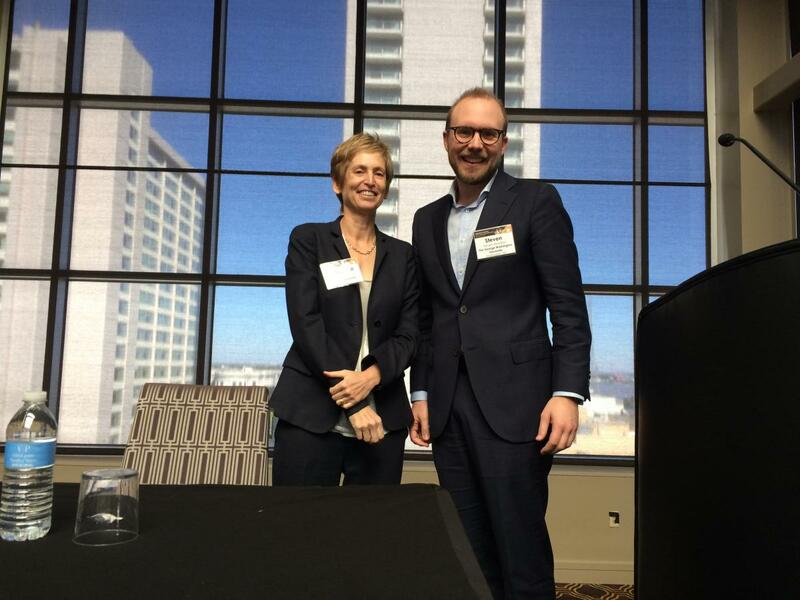 Pictured right are Rosanne Altshuler, President, and Steven Hamilton (OTPR Alum), who received the NTA Honorary Dissertation Award. One of the highlights of each year's NTA Conference is the OTPR Annual Alumni and Friends Dinner. This year was no exception with over 80 people attending and enjoying great food, great fun, and great fellowship! 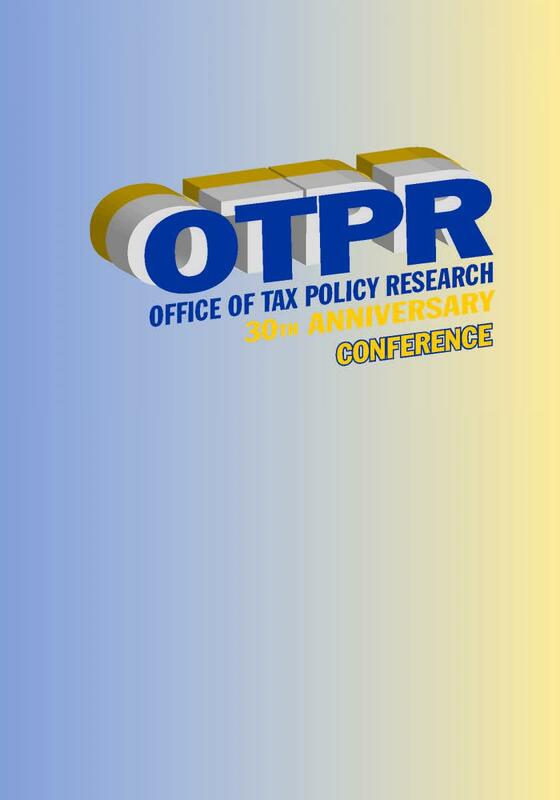 ​OTPR's 30th Anniversary Celebration was held on June 22-23, 2018! The conference was well attended by more than 150 people representing 12 different countries, as well as Federal government offices such as the Joint Committee on Taxation, Congressional Budget Office, Office of Tax Analysis, Government Accountability Office, Internal Revenue Service, Federal Reserve Board, and the Congressional Research Service. Networking, collaborating, and learning were the highlights of the conference, as well as posing for the picture below. In the Conference Booklet, two areas of impact by the OTPR Family were mentioned. 1. A listing of publications in peer-reviewed journals by our alumni for the last 30 years was included. 2. In addition, awards, acknowledgements, and editorial positions by the OTPR family were listed. These can be found in the attached documents. The Office of Tax Policy Research, established at the University of Michigan Business School in 1987, has two missions. The first is to encourage and facilitate joint research on the tax system by economists and scholars of other disciplines. The second is to serve as a liaison on tax issues among the academic, business, and policymaking tax communities. The Office draws on the substantial data resources and expertise already existing at the University of Michigan in these fields, and also involves scholars from outside the University. Our research spans both national and international audiences through numerous means including hosting conferences, sponsoring visiting scholars, disseminating publications, advising doctoral students, and collaborating with academic scholars, business representatives, and policymakers. If you look closely at the map, you will see numerous colored push pins. These pins represent the locations of OTPR Ph.D. graduates, Visiting Scholars and affiliates, as well as OTPR projects. © 2019 Office of Tax Policy Research All rights reserved.